The achievements have been revealed. First time to buzz in for a toss up round. Collect prize wedge 5 times. Collect gift tag 5 times. Collect wild card 5 times. Collect 1/2 car tag 5 times. Solve a puzzle under Express Mode. Solve a puzzle with less than 20% letters revealed. So the game is now confirmed to have every extra wedge on the current show. No word on Prize Puzzles, though. Disregarding the Wheel layout, we know this is in between Rounds 1 and 2. 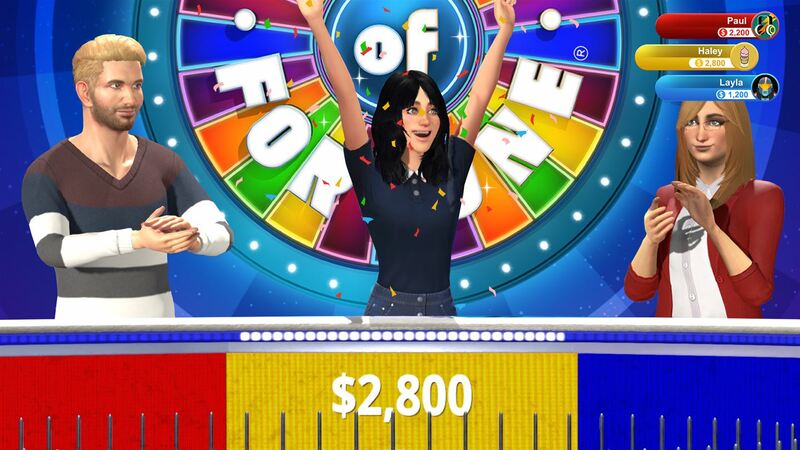 The red player's total shows that she had to have collected the Prize Wedge for her to have a total ending in -70, so this means the Prize Wedges can have irregular values. The THQ games valued all prizes between $5,000-$9,500 in increments of $500. The Final Spin consonant value is shown to be $1650 here, but the red and yellow players have scores that are not multiples of that amount, which means that games can (or might always) have regular gameplay in Round 4. The THQ games always sounded the bells after three actions, and did not go to a Round 5 if the puzzle was solved before then. Contestant creator. Some styles will need to be unlocked. 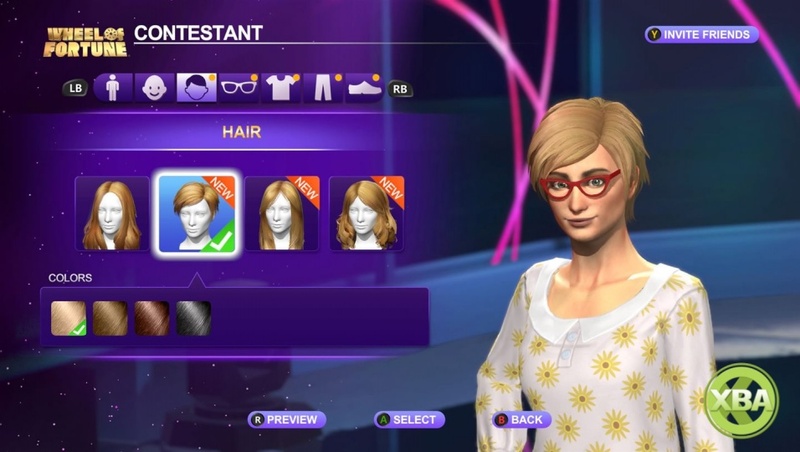 No word on if Xbox Live avatars can be used like in the Xbox 360 game. Imposters! Notice the title card is the generic S30 logo over a purple version of the S26 title card. I figured this will have the Express, but to get confirmation pleases me dearly! Plus, an achievement dedicated to emilburp ? This is YOUR game, Emil! At least the achievement doesn't say "Booyah!" for finding the $10,000 Mystery wedge. More confusingly, how do both the red and yellow players have scores at all when only one consonant has been revealed? I'm sad they couldn't afford Pat and Vanna, but it's better to actually have a new console game than not at all. I wonder what music package they will use. And if this is a decent game, I may buy a PS4 just to have this(I've only purchased consoles for Wheel. 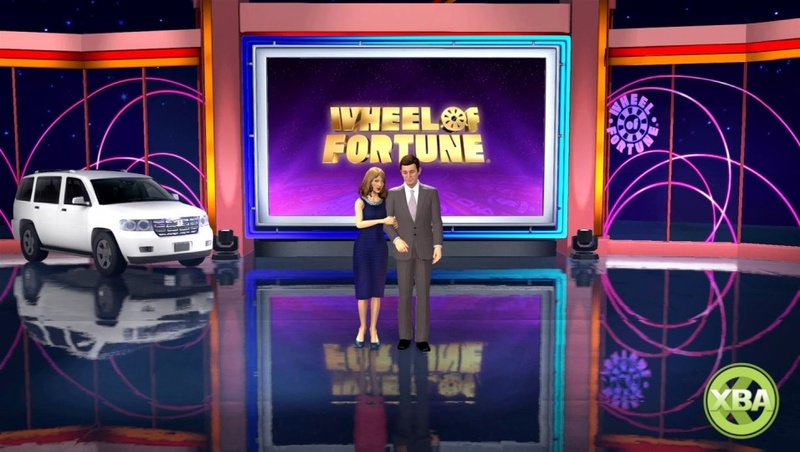 N64, Wii, and WiiU were all purchased because of Wheel of Fortune releases). I look forward to everyone's review. ^And has anyone else noticed that the reflection in the floor doesn't match what the avatars are actually wearing in that pic?? Two more screenshots have been revealed. It looks like that sidebar only displays the total scores and not the round scores. Perhaps that "Final Spin" screenshot is from the game's "Quick Mode", which maybe only does one or two Toss-Ups, one regular round, and a Speed-Up Round. Then the scores would make sense. And here's the other screenshot, which shows the Seasons 33-34 version of the Toss-Up wipe. Not a lot of hope for this game following the Season 35 ruleset. Sadly, the minimum for the bonus round in this game is $34,000, not $35,000. Ah, good find. Thanks for the link. 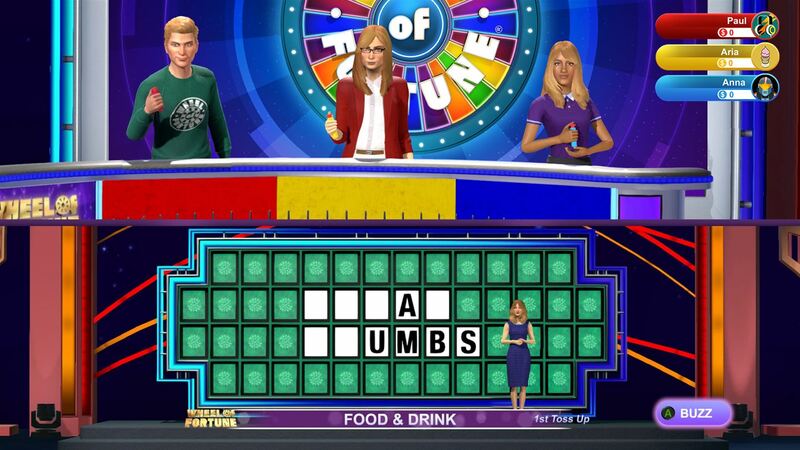 That's the problem with most of these game show video games. They're often made to be released in time for the holiday season, which means they're in development during what will be the show's previous season and will be released only a couple months into the new season with no decent window of time to update the game if there are any changes. 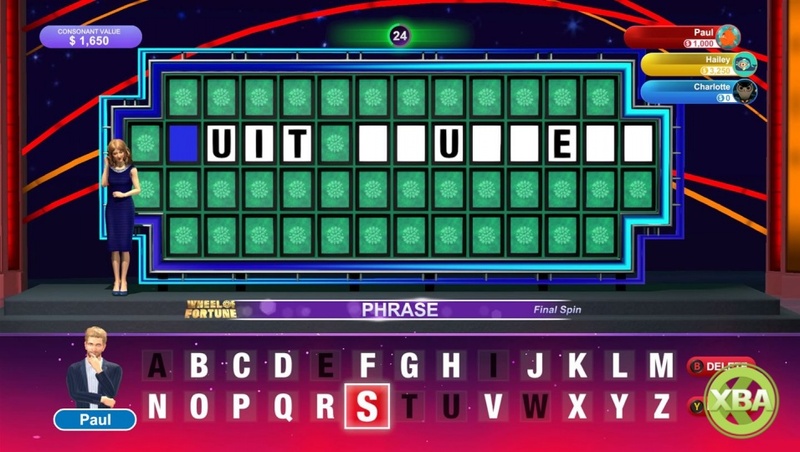 This was most noticeable with Ludia's first video game adaptation of Who Wants To Be a Millionaire?, which was based on the "clock" format but was released after the show had changed to the infamous "shuffle" format. 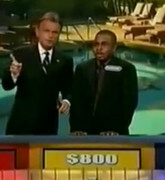 Also, their first Price is Right video game was modeled after Bob Barker's final season even though it was released during Drew's first year as host. 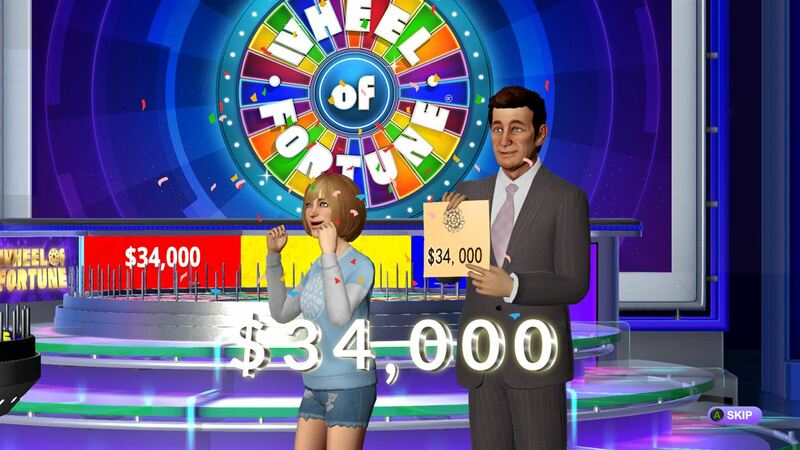 The 2009 Wheel PS3 game didn't suffer from this since it was released in March which was enough time for the developers to implement the then-new Wheel layout, logos, and Million Dollar Wedge. Which makes me wonder, did Wheel give the developers other episodes besides ones from Season 34? Or at least tell them the reason the minimum cash prize is $34,000 because it was the 34th season at the time? You'd think if they were aware of the "season number x $1,000" rule, they'd simply make it $35,000 or even take it back down to $30,000 just to be generic. I mean, they definitely did their homework since the set and even the camera angles are dead-on for the most part. 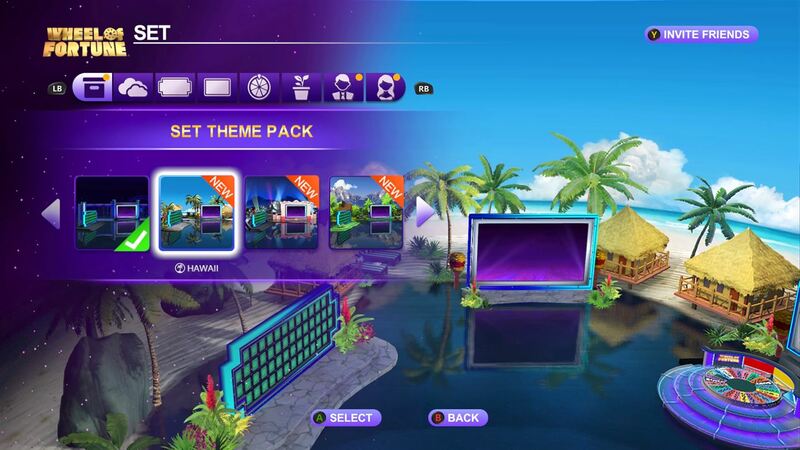 Set menu, which appears to offer a host of customization options, possibly with the option to customize the puzzle board and Wheel in some form, and even the host and hostess, probably just the option to change their outfits. I highly doubt the older sets are included in this version. But we'll have to wait 'til the game is released to know for sure. Well, I thought about $34,000 being the minimum on this version a bit, and I'll be honest with you guys. I'm not complaining. $35,000 has been a playable Bonus value in other adaptions. Besides, I find it a little unique considering it's the only cash prize available in the Bonus Round that's not a multiple of $5000. It may be one's last chance to have that happen because in all honestly, I have a sixth sense that's telling me that the minimum will stay at $35,000 come Season 36. It's a sixth sense that I've actually been having for at least a couple years now. I also love the color of the Toss-Up wipe used from Seasons 33 to 34. The blue color is one of the most beautiful blue hues (yeah, try that for a Rhyme Time Toss-Up puzzle) that I've ever seen. The magenta was okay, but I loved this color. I love the blue Toss Up wipe myself, as well. Besides, it was a nice change at the start of season 33 and chances are you might be right about the bonus round minimum staying at $35,000, Bill. will they have a puzzle and clue maker, and the best episodes? I'm really looking forward to this being released and I started a thread (buyavowel.boards.net/thread/9437/playstation-names-play-ps4-game) for those of us with a PS4 to exchange PlayStation Network IDs so that we can play the game together when it comes out. I'm wondering how much voice acting the game will have, if any. The 2009 PS3 game, the "Deluxe" PC games, and the 30th Anniversary Game and other mobile games had none whatsoever except the chant. The THQ games had a host of voiceovers from Pat, and a few from Vanna and Charlie/Jim, but Pat's "There are X Y's" sound bites were mostly generic yeses or pieced together ("There must me some... T's... how many?"). The Raw Thrills arcade game uses a generic audio-only host who does not call out the Wheel values landed on, unlike Pat in the THQ games, but his "There are X Y's" sound bites are specific. As for the contestants, it would be fun if it was like the N64 game or the Hasbro PC games where there are sound bites of male and female voices calling out letters as they are chosen. The THQ games' contestants did have voices, but just generic sounds of happiness and disappointment. I'm especially curious how audience reaction sounds will be programmed, because the scenarios differ every game. The N64 game would put soft applause sounds for any four-digit value hits and loud applause when the $10,000 wedge was hit, but there were no groan sounds, and the buzzer was used for LAT hits. The old PS3 game had the audience applaud for any non-penalty spin (which were always followed by the old bonus envelope ding). The THQ games would program applause for any special wedge or cardboard (even Free Play), and the top value, but the audience did not groan on incorrect letters, except in the DS version. The 30th Anniversary game used an "ahhh" sound for top value and MDW hits, groans for LAT and Bonus Round losses, but no sounds for Bankrupt or wrong letters. WOF Free Play and some of the Hasbro games used the Bankrupt sound for LAT. The previous mobile games I believe were the only modern-day games that did not program audience reaction sounds following top value or MDW hits. Considering this very rarely happens on the show anymore, I feel like it could go either way with this game. EDIT: WOF Free Play does not use reaction sounds for high amount hits either, but they do use a "ka-ching" sound. I admit that I have had some cautious optimism about this game because I worried it's an attempt to cash in on the faithfulness of WoF fans and not an authentic attempt to create an experience similar to the show. The screenshots have calmed my fears on that a bit along with the look that it seems like they're building upon the previous console game, which I thought was pretty good. On a side note, I noticed that the PlayStation Store is offering it digitally as a standalone game without Jeopardy! packaged in with it. I preordered a retail copy of the combo but may take it back if the digital standalone is significantly cheaper since I don't plan on playing J! much. Also, it's likely that I won't get my copy in the mail until later in the evening whereas I assume I can start the download and install of the digital version at midnight if it follows the trend of other digital games. Thank you, Xbox Store for midnight digital releases. - Wheel layouts are 100% accurate with the show. All the add-ons are in the right spots in the right rounds, and the yellow $600 becomes $900 for R3 only. - There are no Crosswords. - Round 4 is always a full Speed-Up Round. - Same Letter has its $1,000 bonus. 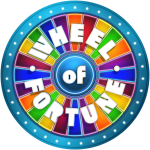 - You can choose what Prize Wedge and Gift Tag will go on the Wheel, but only one of each is available from the start and the rest have to be unlocked. - The Prize Wedges are all trips, all worth $7,320. The Prize Puzzle uses trips from the same set of trips available through the Prize Wedge. Any time a trip is won, it is followed by a fully-voiced copy with live action video much like what'd you see on the real show. - The Prize Puzzle is not always themed to the prize. My first PP was "DOTING MOTHER" for a trip to Egypt. - The Gift Tags are for fictional companies. 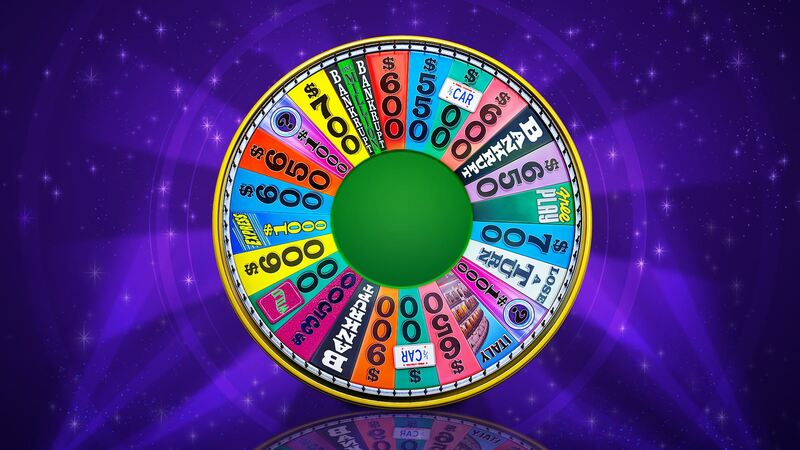 - The host is fully voiced, including sound bites of letters, categories, and Wheel values. - The contestants do not have voices aside from the occasional "What?!" on a lost turn. 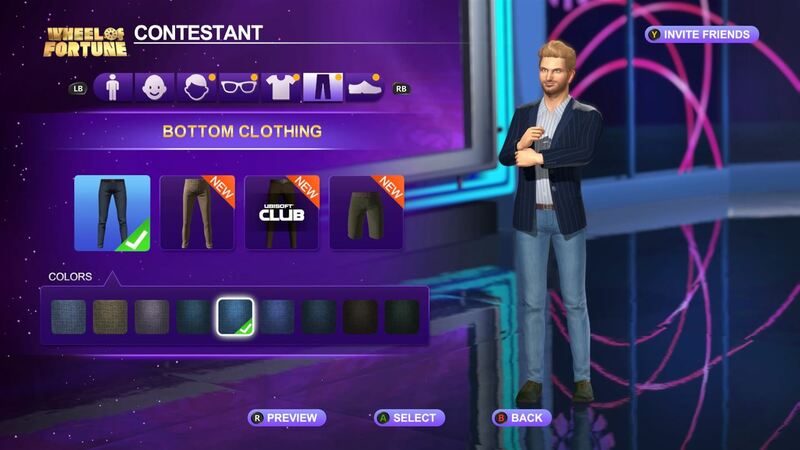 - All male contestant avatars have facial hair. - The current music package is used. The previous package's solve cue is heard whenever a player cashes in at least $5,000 from one correct consonant call. - Soft music plays throughout gameplay. - For some reason, the buzzer sound from the show is not used. A different-sounding buzzer is used for missolves and buzzouts and there is no sound effect at all when a wrong letter is called. - The Bankrupt sound effect is used for Lose a Turn hits. - The loading screens have game tips and trivia like the THQ games, one of which mentions the show's official premiere date of January 6, 1975. - There are four additional sets to unlock: Hawaii, Movie, National Park, and Philadelphia. You can even combine different elements from each set to create your own custom set. - No solo mode; all three slots must be occupied, and each human player needs their own controller. - Quick Mode and Family Mode shorten the game to the following format: $1,000 Toss-Up, Round 1, Round 4 Speed-Up, Bonus Round. - The games begin with a video of the Season 34 intro sequence with the Pat and Vanna posters removed. The first part of the opening spiel is Jim's voice, but the hosts' intro is by a different announcer who sounds similar to Jim. 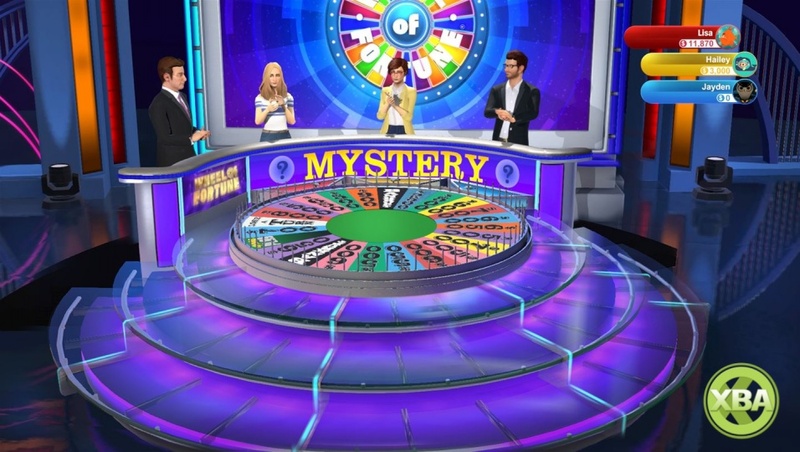 - There are no audience reaction sounds for big spins or lost turns, although there are sometimes gasp sounds when the Wheel slows down near a prize, top value, or penalty. - The computer players are extremely easy even on the Hard difficulty. They are prone to calling mid-tier consonants and even Q's very early on. They are also fond of calling vowels in the Speed-Up Round. - It appears that the Million Dollar Wedge does not need to be locked in with a solve and carries over to other rounds regardless. In my second game, a computer player picked it up in R1 but lost the round. When he hit Bankrupt in R3, the host's voice said that he had to take back the MDW. Here is a gameplay I recorded.